Listen to the song while you read the post! Performed by Josh Groban, from the Beauty and the Beast (2017) soundtrack. It’s been a year since I launched this blog. 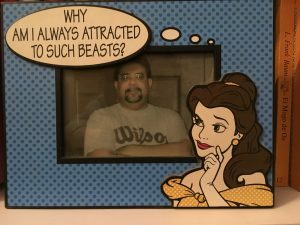 I’d spent what feels like a lifetime collecting Disney inspirations and insights that helped me sort through the many emotions involved in caregiving and grief. 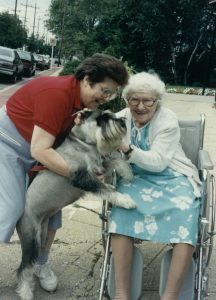 I have learned a lot as I have written blog posts and corresponded with caregivers and those with ALS and other illnesses. I am grateful and humbled to have made new good friends through bad circumstance. I am also coming to a more peaceful understanding that the people I’ve lost are and will be with me and part of everything I do and everything I am, evermore. My very first post began with one of my very first quotes, “You are braver than you believe, stronger than you seem, and smarter than you think,” which Christopher Robin told his friend Winnie the Pooh. I continue to remind myself of this and often to be surprised at just how true it is in caregiving, grief, and life! Wise little boy, and not so silly old bear! I do reflect on my experience in grief, and on the judgments I’ve felt from others, and have made of myself. Last week, I wrote about how Ben was not defined by what ALS had done to his body, that he was still Ben inside, and he needed, and deserved, to be related to as he always was. 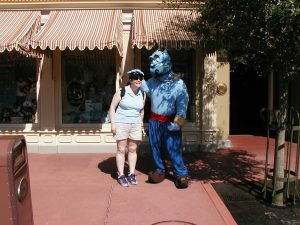 As I wrote “What Aladdin Knew About Appearances,” I thought about how grief is not always displayed on the outside. I have sometimes altered my outside to cover what is going on inside, so that people who care about me will feel relief that I am doing well and not find me to be a drag. I will admit that sometimes acting cheerful on the outside can help cheer me up on the inside. Unfortunately, that does not always work, and sometimes it has backfired, leaving me drained and even sadder. I will always be grateful for waterproof mascara! Even before I was ever in grief myself, I heard people comment that a particular period of time had passed, and someone should have “moved on.” If you’ve read this blog, you know I don’t like that phrase because it feels like it is saying that I have left my loved one behind. Maybe it’s just semantics, but that’s the way it resonates with me. I never understood the concept of a designated amount of time for grief. Did people think I was over the loss of my dad too soon, since I had returned to my caregiving routines quickly? Or, since I didn’t get to grieve my dad’s loss, was it two for one grief or did I get an extension on my time to grieve after Ben died? Ridiculous, indeed! After I lost Ben, many people rushed to tell me that I had my life back so I should be happy and make this time about me. Happy? Really? Telling me I have my life back was not helpful. Yes, I did understand that they meant I had more freedom. Note to self: I have to be less understanding of people who tell me what and how to feel rather than asking me how I’m feeling. The truth was that after caregiving for my dad and then Ben for more than seven years, I did not know what to do with this life and freedom that had been returned to me. And, there were many times that I did not want to know. I was simply having a hard time without them. But, it was easier not to argue the point, and, I either kept my distance from these people or superficially put on a happy face. Those people never really saw what was going on inside my head. I don’t even think they would have understood, but the potential frustration was not worth it to me. My friends know that I cry easily, so to cry in front of them was nothing new. But, I tried to enjoy myself with them, particularly shortly after Ben left. They felt relieved to see me smiling but they were very sympathetic, too. However, I was very conscious of and uncomfortable with my smiling and laughter because they did not match what I was feeling inside. For at least a year, and still at times, I arrived home in a puddle of tears. It is very stressful to fight your emotions. But, I had to test the waters and slowly ease myself into the land of the living. Fortunately, I did have some wonderful people supporting me. From the time that Ben “left” (his word), I have also judged myself in my grief. Am I doing enough? Am I getting out? Am I crying too much? Dwelling on the loss? Am I OK? What is OK? When I joined a support group and said that I’d cleaned out our storage space after a few months, and another woman said that she had not cleared out a thing, I immediately felt guilty. I thought about how my dad never removed my mom’s bathrobe from their bathroom- time stood still. What’s right? I have come to believe that everything and anything can be “right” if it feels that way, and it might feel that way in one moment, but wrong in another- that’s the hard part. As I look back, I think that it was the man I hired to repaint and carpet my apartment who genuinely understood what I was grappling with as I tried to reclaim my life. He spoke little English, but since I speak Spanish, we communicated pretty easily. But, he seemed to understand my struggle as I explained things about the apartment and what I was changing. He saw the conflict between excitement about the changes and painful memories of ALS, caregiving and loss. He did not know me, he did not judge me, but he supported me as we respectfully changed things together. At each instance where I have done something for myself, I have been so touched by the support I have received. People want me to be doing better. I want me to be doing better! My visit to London after many years, my theatergoing, my increased socializing, and now, my dating, has made my friends and family so very pleased for me. I have to admit that I am proud of myself. But, sometimes I put that information out there almost to convince myself that I’m okay. This is a strange summer, in which I’m back in the land of the living while in my head and heart I am reliving all of my memories of my last summer with Ben. My emotions are “Inside Out” now, and I wake up every single morning thinking about my summer in the hospital with Ben. I put my posts on Facebook with all of the Broadway and ballet I’m seeing, and the lovely times with friends. I feel unsteady because my moods fluctuate quickly from happily engaged to distraught and in tears. But, I’m still living, and more and more often without guilt. Some people quickly move beyond any mention of Ben and my dad to remind me that those days are over. Well, the days are over, but the emotions are not and the memories live on. It’s a juggling act. The sadness does not bowl me over as frequently, though on the anniversary of the day Ben went into the emergency room, I stayed in bed crying and watching “Monsters, Inc” with our Sully dolls. And, no matter what anyone says, I think it’s okay. 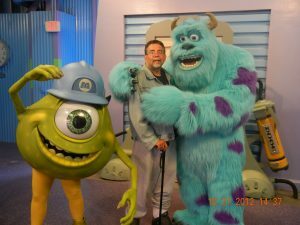 2012-Ben was so happy to meet his favorite buddy, Sully, at Hollywood Studios. My experience with grief has shifted. From barely being able to grieve the loss of my dad to losing Ben and feeling like I was grieving the loss of both of them, what I have learned about grief is that my emotions are my own. I don’t have to explain or defend them. I do not have to listen to judgments from anyone, and I need not judge myself either. I’m doing okay. Sometimes, smiling and engaging in life does help me smile more on the inside, but sometimes it doesn’t. That’s the lousy side of grief- it’s unpredictable. These days, I am not as vulnerable to the judgments of others. People may have a timetable for grief, but my own timetable is all that matters to me. In the past nearly two years, some people have commented that they are amazed at how much I handled when caring for my dad and Ben at the same time and losing them within a short time of each other. Some people have commented that they think it’s great that I have reached out to offer support to others who are dealing with ALS as patients and/or caregivers. Some people feel like I’m caught in the past. Some people feel that I can’t really begin dating because Ben is still so much a part of my life. I know that the judgments are usually grounded in a desire to see me thrive. I want people who care about me to feel like I’m doing better. And, I am, but it has to be on my terms and in my way. 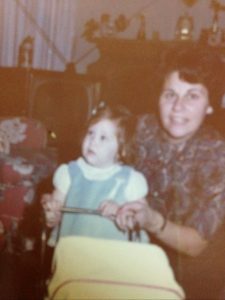 It’s not easy for me to say that, but maybe reflecting on my caregiving experiences has revealed to me my resilience and given me a bit more confidence. My weekend in West Hampton was filled with less guilt for a good time (click here for that post). The Fab Faux concert was filled with much more smiling than sadness. 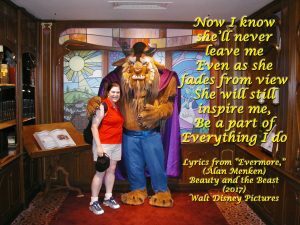 In the lyrics to “Evermore,” Beast was talking about Belle, and I feel the same way about Ben, and the loved ones I’ve lost. The grief process has led me to a place where having them close to my heart in so many memories is always a comfort, even if it comes with tears and missing them. I’m learning to be here in this world with the knowledge that Ben is a part of everything I do- as are my mom and dad- and they will never leave me. I am creating a new way of relating to them and they are here, without physically being here, evermore. If you are in grief and you feel that you need additional help, join a support group, seek therapy, or contact an association working with you or your caree to see if social work services are available to you. If you are dealing with someone in grief, ask them how they are feeling, let them have their emotions, and let them know that they also have your support. Early in our relationship, Ben gave me this frame with his own picture inside. It’s a good memory that still makes me laugh. This time of year has become a difficult and confusing one and I am just learning to roll with my emotions rather than fight them. As I’ve written, as a teacher, summer is a delight. Unfortunately, summer comes with painful memories of much time at doctors and in the emergency room with my dad. And, in 2015, it was the time that Ben declined drastically, spent the summer in the hospital, and ultimately, passed away just before I began a new school year. It stands to reason that at this time of year I find myself dwelling on and reliving the many things that happened during Ben’s hospital stay. I think of the assumptions people made of Ben when they saw him in a scooter or electric wheelchair, or spoke with him and maybe had difficulty understanding him. 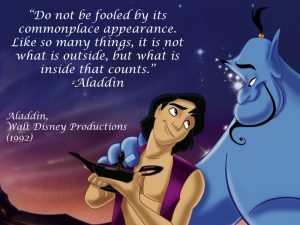 I have learned that, as Aladdin said, the outside tells one story, but what is going on inside our hearts and minds that really counts. ALS slowly stripped away Ben’s ability to move his limbs, chew and swallow, and it also caused his speech to be impaired. He was bravely determined to maintain as “normal” a routine as he could, despite those struggles. Of course, he did not like what was happening to him, and because ALS does not affect cognitive skills, he was well aware of what was going on. ALS was part of every single thing we did, every single day. But, he was more than the ALS that constrained him on the outside. Inside, he was still Ben. With ALS came Ben’s deep feelings of alienation. Ben noticed that people changed with regard to their interactions with him. As it became harder to understand him, some people stopped trying. Speaking by phone was difficult because it was more difficult to understand him and because he could not always answer the phone quickly, so he would have to return calls. Some people sent texts because Ben could access those on his computer and could use a virtual keyboard to reply. I was always happy to come home and find him corresponding with someone because it kept him engaged in the world and let him know that people thought of him. But, in large part, he was alienated. His abilities had become limited, but he had not. And, he was hurt. When we were outside and he was in his electric scooter, he chuckled because he said that his speech impairment seemed to lead people to believe that he was mentally challenged. I was glad that he usually found humor when people spoke to him as if they were speaking to a child. But, it did frustrate him when, upon hearing his speech impairment, people ignored him and only addressed me. I took the lead in these situations, turning to him and directing questions to him. Some people realized quickly that he could communicate, but others clearly lacked the patience. As his advocate who loved him, I lacked patience with those people. When Ben went to the hospital, he was given a Bipap mask and put on a ventilator. This was a whole different kind of problem in understanding him. It was the first time that I had to try to read his lips, and it was challenging because the mask obscured his mouth. Aside from the fear of being in the emergency room and not knowing what was going to happen, it was extremely frustrating for him not to be understood. It was frustrating for me not to be able to understand him. Once admitted into the hospital, we learned a way to spell out each word. Imagine spelling out each word that you say: For each word, letter by letter, first, I asked if it was a vowel. Then, I asked him if the letter was in the first half of the alphabet or the second. Once determined, I proceeded to spell out the alphabet until he nodded that I’d hit the right letter. Sometimes I could figure out the word quickly without all of the spelling. Not often enough. I wrote out the words and sentences. It was taxing. There were times that he shook his head rather than go through the process. When you are not expressing yourself, you begin to lose yourself. A hospital is a busy place. Nurses, residents, doctors, medical students and a lot of other staff members filed in and out of the room. If Ben’s mask shifted, the alarm rang, which was stressful and scary, though easily remedied. Sometimes, people tried to talk to Ben. Most of the time, they talked to me instead, and they often did that right in front of him. Ben could not even move his hands or arms to signal that he had something to say. This was one of the reasons why, although people told me that I was spending too much time in the hospital, I felt compelled to be there. Also, Ben could not call for help. People did not always take the time to ask him questions and simply checked the numbers on the machines. On a certain level, it was understandable that staff was busy and as long as he was safe, they were doing their jobs and Ben was as stable as he could be in his condition. What people did not realize is that what they saw on the outside was contrary to was going on inside Ben’s mind. Ben had a lot of opinions, he understood what was being said and asked, and, most of all, he mattered and he needed to know that. I found that a critical role that I played was as a facilitator of discussions between Ben and hospital staff, as well as visitors. When people addressed me without acknowledging Ben, I turned to him and immediately engaged him in the conversation. I showed people how we spelled out words. I did not let people put words in his mouth. I also asked a lot of yes/no questions, which made it easier for him to respond. On the outside, Ben may not have appeared to be a vibrant person, but he was. Even I needed to remind myself of that when I got so caught up in caregiving responsibilities that I didn’t pay attention to who we were as a couple. I showed him love by holding hands, looking into his eyes and letting him know that even if we were struggling to communicate, I was there for him. If you are in a position where you are visiting or dealing with someone who has difficulty communicating, please do not ignore that person. Acknowledge his or her presence. Show the person that they matter and are more than their medical issues. If there is a caregiver to help, still involve the person in your discussion. Express kindness and compassion and really look at them to see deep inside the person you truly know. Don’t assume that what you see on the outside is what is on inside. 2010- Shortly after Ben’s ALS diagnosis and still standing, albeit unsteadily. 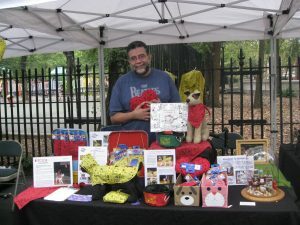 In his favorite Beatles shirt at a fair with my Pets en Voyage products. These days, I find that I spend a lot of time reliving the memories of Ben’s last summer, which we spent in the hospital. The memories are often difficult, and there are many tears, yet, I also do remember the profound love that we showed each other. I am beginning to be able to honor his memory with more of the joy I experienced with him, despite the overshadowing realities of ALS and losing him. This weekend, I was invited to my friend’s home in West Hampton, NY. It was absolutely beautiful. For several years, I was not able to have a weekend getaway. I could not and would not have left Ben. 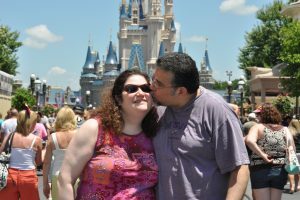 Though I did think about that while I was away, and about how Ben and I loved to go on little getaways, I felt less guilt this time, and I was able to really enjoy myself. At times, I enjoyed myself through Ben’s eyes. He would have loved the water views, as I did, and he would have had so much fun at the farmer’s market and outlet shopping. Knowing these things does sometimes bring much sadness, but it also keeps him close, and that lets me embrace life more easily. The event Ben would have loved most of all was the concert we saw by the Fab Faux, a Beatles cover band that is absolutely amazing. I had never seen them before last night, and the concert was THE place to be in West Hampton! The seat next to me was empty, which was unusual given the sold out crowd. But, to me, it was as if that seat was there for Ben. I listened to and loved that concert for both of us. At the end, the band played “Twist and Shout.” This was the first song that Ben and I ever danced to, starting when we were at a gala for the organization where we worked and met. 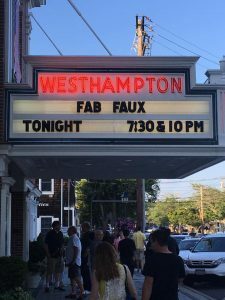 It became one of “our songs.” When the Fab Faux began to play the song, I actually felt a sense of panic as all of my emotions converged, and I didn’t know how to react. Ordinarily, a memory that dear to my heart would make me cry- happy to hear it but missing Ben and thinking of the dances that we will never have. Last night, however, the song made me smile and, yes, to twist and shout. I was lost in the smiles and laughter of those memories. I felt Ben there with me and I enjoyed the live performance in his honor, with the tremendous enthusiasm that he would have felt. I know that he will always be dancing with me. Amazing band! Check them out! Today, July 8, would be my mom’s birthday. 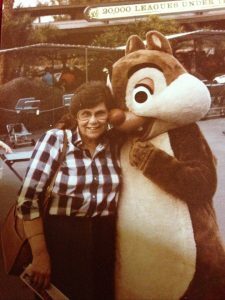 I have written quite a bit about my mom and how close we are, most recently on Mother’s Day, but also on the anniversary of her passing and in many references on this blog. When I think about being in the hospital with Ben two years ago on her birthday, and wondering what was going to happen to him while missing her, I feel overwhelmed by the fact that I have lost the people I loved the most in the world. I do feel so fortunate to have known and shown so much love in my life. But, sometimes it can feel terribly lonely. Last week, Michael Bond, the creator of Paddington Bear, passed away. Paddington Bear was my mom’s other favorite character. I remembered how excited my mom was to go to Paddington Station and the Paddington store in Paddington. 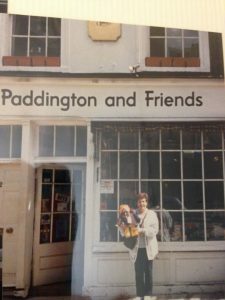 The woman in the shop was so taken by my mom’s exuberance over the little bear and being in the shop- it was hard not to get caught up in my mom’s child-like delight- that she excitedly handed my mom a Paddington Bear doll to hold while I took her picture. 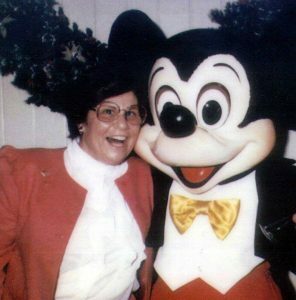 So, it wasn’t all Disney, but Mommy’s first true love was Mickey. I look at our old photographs and remember the laughter. I am proud to have inherited her ability to celebrate her inner child, her youthful demeanor and her joyful spirit. Sometimes people are surprised that she passed away more than 25 years ago, because I talk about her so frequently and vividly. She is always dear to my heart and so much a part of who I am, but also, of the person I aspire to be. 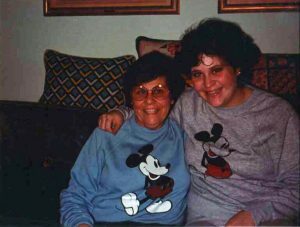 On her birthday, I like to watch “The Little Mermaid,” because I love to remember how much we laughed when we watched it together, particularly when we looked at my grandma, who just did not understand our delight. Happy Birthday, Mommy! I love and miss you every single day.